I guess I will never learn my lesson. A few weeks back, Frank Bruni, gave Dovetail a 3-star review in the New York Times. Of course, though I am consistently disappointed when Bruni hands out a 3-star rating, especially when he is reviewing Italian restaurants, a rating of that magnitude left me no choice but to visit the restaurant. In fact I managed to miss eating at Compass, John Fraser's prior restaurant, as friends told me I wasn't missing anything . But this time there was a substantial buzz about the restaurant, and I succumbed, despite my better judgment. So after going to see the riveting film, The Counterfeiters, at Lincoln Plaza Cinemas on Saturday night, we strolled up Columbus Avenue and got a table for 2 as a walk-in at around 10:00. How things got this way needs to be explained. You see Wylie is a member of the OA Food Discussion forum (under an assumed name that is) and he gets to read everything I, and the other members of the forum, write about the restaurant. If one were to read the thread on WD-50 on the site, what you would find is a treachorous roller coaster of highs and lows that have been broken up into three basic categories. Those who love the food all of the time, those who dislike it it most of the time, and those who go back and forth depending on where Wylie's cuisine happens to be at the moment. Your's truly happens to fall into category three and that's the source of our contention. For some reason I stop eating fancy meals in the summertime. Not that I stop eating completely mind you, but the idea of putting a jacket on and consuming a multitude of courses doesn't have much appeal to me when it's hot out. I'm much happier in shorts and a T-shirt, grilling up large slabs of prime beef sourced from places like Lobel's, Citarella, or Bryan Flannery on my barbecue, or throwing on chinos and a linen shirt (never tucked in) and going to places like Ssam Bar, Resto or Hill Country. It's funny but I'm not even conscious of the switch. But when July comes, the urge to consume a dozen courses at a time dissipates. But then September rolls around and all of a sudden the desire to eat as a pastime returns. And so it goes that in the first three weeks of this dining season, I managed to eat at Blue Hill Stone Barns, Per Se, Tailor and Atelier de Robuchon as well as sneaking in one course plus dessert at someone else's meal at Jean George. The Stone Barns dining room was alive with scenes of the end of the summer when we visited on the first Saturday of the month with Captains parading though the dining room with baskets holding multiple varieties of heirloom tomatoes, long trays with four different types of wild mushrooms, and a tea cart holding large glass jars that were filled with herbs for tea. It was a great bit of dining theater and the show alone made one hungry. As you can imagine, those ingredients end up in the dishes we were served, which in our case included various tomato dishes, a slow-poached Stone Barns egg served atop bitter greens, some of tastiest boneless chicken wings I have ever come upon which were paired with wild mushrooms and greens, and a rack of pork and its bacon served with a sauce that had quinoa as its base. A truly delicious meal and I am eager to return for the next tranche of the harvest which is when fall vegetables are in season. What Happens When You Eat at Jean Georges, Per Se, Bouley, Eleven Madison Park & WD-50 All in the Same Night? It all started on a Thursday evening in January at a nondescript restaurant located along London's Wapping Wall called "BBQ Shack" where the London contingency of the OA discussion forum was having a get together. Mrs. P and I were in London for a long weekend and we had planned to stop by the restaurant in order to say hello to everyone. Under normal circumstances we would have attended the dinner proper, but food wasn't really on my mind as four hours earlier I had finished a rather large lunch while sitting at the kitchen table at Comme Chez Soi in Brussells. But truth be told, the prospect of eating American-style barbecue in London didn't sound all that appealing to begin with and I was secretly happy that I had an excuse to skip the eating portion of the evening. So our plan was to arrive in mid-meal, stay for about an hour, and then take a taxi back to the West End for a late dinner. Just as we were getting ready to leave, one of our group pulled me aside in order to have a short chat with me. It was Jay Rayner, the restaurant critic for The Observer newspaper, and he started telling me about a new book he was writing. I couldn't quite work out what the book was about, but I did manage to pick up on the fact that he wanted to come to New York and spend a day following me around while I was eating. "Would I agree" he asked? It didn't take me long to say yes. After all, I am a food blogger, and what better ratification of one's culinary abilities could there be than to have your dining adventures memorialized by an author and the Henry Holt publishing company. Still, I was a bit uncertain why following me around to watch me eat would make an interesting story. Jay said he would be in touch and Mrs. P and I jumped into a taxi headed for the West End where we enjoyed a late (and very light) dinner at Noura. The next time I saw Jay was at London's Tayyabs restaurant in April. A mutual friend of ours had passed away and we were both there to attend a charity dinner in his honor. At the end of the evening Jay told me he had set aside the last week in May for his trip to New York, and that he would be in touch so we could determine exactly which day we would spend together. I asked him if he had anything in mind and he said, "No the point is for you to decide and for me to follow you around in pursuit of the perfect meal." The "perfect meal" I said to myself. Now what exactly would that be? My mind raced through the list of top New York restaurants and while you could eat really well at many of them, I didn't think any one particular could serve a perfect meal from beginning to end. Our next correspondence was around May 15th, and we decided that our little adventure would take place on Wednesday May 30th. Well even though the date was set, I still quite hadn't worked out where we were going to eat. But with the date quickly approaching I went into overdrive. At first I asked Jay if he wanted to do a crawl. A few months earlier I had taken Sergio Hermann, chef of the Michelin 3 star restaurant Oud Sluis in Holland, on a dining crawl and it was a huge success. Jay responded that a crawl would be fun, but it was totally up to me. Then I had a strange idea. Instead of a crawl of casual restaurants like the one I did with Sergio, what if I organized a crawl of the City's top restaurants and we had a dinner comprised of one or two dishes at each restaurant? I told Jay of my idea, and he responded by kicking the ball back to me and telling me that it was totally up to me. But just as I finished reading his message, I was notified that another message had arrived in my inbox. I opened the link and it seems Jay had a change of heart. "I've thought it over and I think that's a great idea. Let's do that." Back in the days when I was still cutting my teeth as a diner, I used to wonder why restaurants didn't serve their cuisine in smaller portions. The benefits seemed obvious to me. Why couldn't you order a single Robuchon lamb chop along with a small pot of mashed potatoes? Or maybe a tasting size portion of Alain Senderen's Canard Apicius might hit the spot. But even though it seemed like a no-brainer, unless you wanted to eat classical Spanish tapas cuisine, the small plates concept didn't exist outside of my imagination. That all changed a few years back. I'm not exactly sure who was the first to take the plunge but now small plate restaurants are everywhere. Ironically, the most famous small plates restaurant of our time is run by Joel Robuchon himself. In fact Robuchon, after closing his haute cuisine restaurant in 1993 so he could retire and live in Spain, has opened a mini-chain of small plate restaurants and currently operates seven different locations in four different countries. And lo and behold, my beloved lamb chops and pommes puree are the stars of the menu. I guess Monsieur Robuchon must have been reading my mind. If you see him please thank him for me and tell him I'm honored. It was September 1982 and Mrs. P and I were on a late afternoon flight from London to Paris. It was our first trip to Europe together, and after spending four days in London we had planned to be in Paris for three days. Though I knew very little about fine dining back then, I had been in Paris once before and I knew how good even the most simple food could be. Fortunately, an older colleague of mine knew Paris well and I had booked a few places that he had recommended (La Maree and Bofinger for those of you who like to know all of the details). But I had left our first night open, primarily because I was concerned that our flight would be late in departing London. Normally the lack of dinner plans would have had me worried. But on my first trip to Paris in 1977, I learned that it wasn't difficult to stumble upon a good place to eat. In fact if we got in too late to have a proper dinner, and we ended up eating crepes from a street vendor on the Blvd. St. Germain, washed down by bottles of cider at a bar, I would have been perfectly happy. We were in mid-flight when Mrs P (actually the future Mrs P at that time), was reading the International Herald Tribune. All of a sudden she turned to me and said, "Hey listen to this. There is a story in the paper about the chef at the restaurant in the hotel we are staying at. 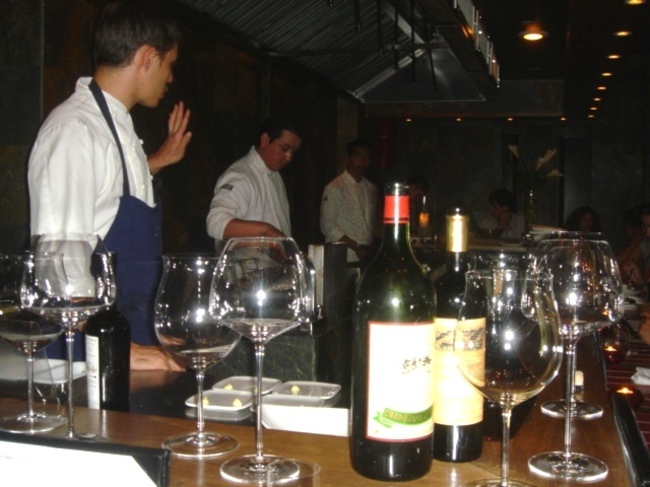 The Michelin Guide has awarded the restaurant a second star, and he is the youngest chef ever to win that honor. Maybe when we check into the hotel we can ask them if we can have dinner there tonight?" Though I had never heard of the chef, I agreed that we would inquire about dinner upon check in. We marched up to the reception around 8:30, and it didn't take long for the person at reception to tell us that the restaurant was happy to take the two of us for dinner at 9:00. I'm sure those of you who are old enough to remember, and who were into fine dining back in those days, know that I am talking about the Hotel Nikko in Paris's 15th arrondisement, which during that time housed a restaurant by the name of Les Celebrities. And the name of the chef at that restaurant, the one who was just awarded his second Michelin star, the youngest chef ever to win that honor, was none other than Joel Robuchon. And at 9:00 that evening my culinary life was born. When you spend a ridiculous amount of time, energy and money eating at restaurants, you get to know a few of the people who work in the restaurant industry. One such person I have become acquainted with over the years is Chris Russell, currently the General Manager of the Union Square Cafe. I must have met Chris close to 10 years ago when he was a Captain at Gramercy Tavern, and he handled a number of wine dinners that my friends and I had organized at the restauarnt. It was way back in the day when Tom Collicchio was doing the cooking himself, and I recall Tom bounding out of the kitchen on more than one occasion to get himself a pour of some unusual wine that we were drinking. Nowadays Chris has moved up the food chain and is a big shot, and instead of organizing the food for my table, he graciously takes my phone calls when I need a table at USC on short notice. He is the living evidence that on occassion, nice people who are dedicated to their job actually get rewarded in life. But getting a table on short notice isn't the only benefit I got out of our acquaintance. One day an invitation to the Union Square Cafe 20th anniversary party arrived in the mail. Why yes, Mrs P and I would be honored to attend, thank you very much. It was a fun affair that included some tasty hors d'ouvres being passed around by the waitstaff. But what impressed me most about the occassion was that the guest list for the party wasn't just a who's who of the city's culinary cogniscenti, it became clear fairly quickly that most of the guests were customers who were being thanked for their support over the years. Mrs P and I settled in the bar area, but about an hour into the party Chris approached us with someone in tow and said, "Steve, I would like you to meet Richard Corraine who is a principal in the Union Square Hospitality Group." The introduction took me a bit by surprise. Up until that point in time, I didn't realize that Danny Meyer had partners who weren't the chefs that operated their restaurants. But what the hell, I can adjust to just about anything on short notice and we settled in for a chat.